Your ankle is a hugely important part of your body when it comes to moving around, whether it’s walking, running or jumping of some kind. We all want to avoid ankle pain. However ankle injuries seem to be a common occurrence, which result in much pain and a long and frustrating recovery time. The ankle joint is a multi-directional hinge which provides shock absorption, stability, propulsion and is adaptable to changing terrain. There are many tendons and ligaments which keep it stable, allowing us to stay upright whilst moving. The most popular ankle injury by far, which I often see in clients who come to me, is the classic ‘twisted ankle’. This is where the ankle has rolled outwards and the sole of the foot inwards. It is known as an ‘Inversion Sprain‘. This can cause damage to the tendons, ligaments, muscles and nerves which surround the ankle. In particular the lateral ligaments tend to get overstretched, ie the ones on the outside of the foot. Pain, bruising and swelling is normal when this occurs and it is very hard for the ankle joint to bear any weight. Usually these sprained ankles will recover in time by themselves. In extreme situations there can be a bone fracture, in which case medical advice would be wise. Much less common is when the ankle rolls inwards and the foot outwards, known as an ‘Eversion Sprain‘, which often results in ligament tears. Other causes of ankle pain can be stress fractures, impingements or a strain on the deep lower leg muscle, known as the tibialis posterior. These all are often a result of overuse or repeatedly pounding pavements. This action limits the overall mobility and flexibility in the foot and ankle. Your foot is designed to withstand uneven terrain, to be flexible in many directions. A continual repetitive movement will, in the long term, have an impact. I think it is useful to know why the most common problem, the Inversion sprain is likely to happen, to avoid ankle pain. An ankle will turn outwards when you are travelling down a hill, when the foot and ankle are in a pointed or ‘plantar flexed’ position. 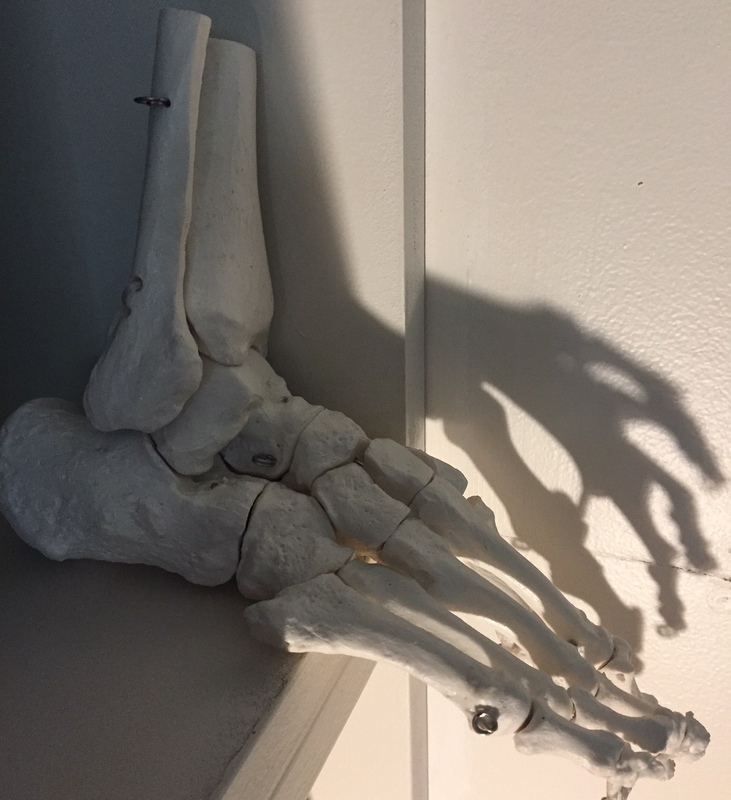 Due to the shape of the bones in this position, the foot itself is at its most stable – it is ready for impact on the ground. However the ankle joint is at its most unstable, not expecting any weight until the foot has flattened onto the ground. When the foot flattens on the ground, it unlocks. Now the ankle joint locks itself in order to allow the body to move over the foot. If you tread on something like an unexpected loose rock when your foot is in the plantar flexed position, the ankle joint will immediately just buckle and roll outwards, resulting in an inversion sprain. You can understand this well if you experiment yourself: try to ‘twist’ your ankle in these two different positions – with your foot flat on the floor, then try and do it standing on tiptoes. Notice the difference between the two actions. If you have sprained your ankle, then you need to keep it elevated as much as possible, and keep it moving. Try to draw out letters in the air with your toes. Be guided by your pain, if anything is too uncomfortable then stop. You may find that a side to side movement is too sore to do at first, so concentrate on an up and down movement instead (flexion and extension). Soft tissue injuries can take many months to properly heal, so be patient and keep the joint moving. Keep your ankles strong and flexible. Regular stretching and exercising of the ankle joints will make a big difference. Sit on the floor with your leg out stretched one at a time. Loop a belt around the sole of your foot to help guide it in a straight line as you flex and extend your ankle a few time. Make sure your foot moves in a straight line and does not wobble from side to side. Balance training will improve co-ordination. Stand on one leg, try with knees straight and then bent, moving between the two positions. If you wobble when standing on one leg, this indicates it will need some work. Make this more difficult by then doing it on an uneven surface, like standing on a cushion. Try with your eyes shut too, it makes it harder. Practice running or walking on uneven ground as much as possible. This quickly improves your agility. If you like to walk, remember not to wear your walking boots laced up to the top. This is very important. The ankle needs to be able to freely flex and extend. Keeping it locked in one position will over time, weaken the muscles and leave it easily prone to future injuries. Good footwear will help massively. A good grip and low level sole of your shoe or boot will reduce the risk of injury. Be present. Sprains often occur when we are not paying attention, I know this from personal experience. When our minds wander off on to something else, it is easy to be taken by surprise by an unexpected obstacle! A regular deep tissue massage treatment will help to keep your ankles flexible. Soft tissue tightness may eventually affect how the ankle is moving. Massage can address this early on before problems arise.